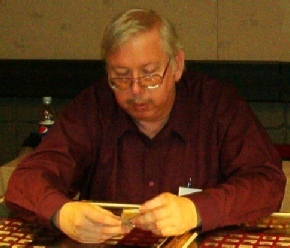 Michigan Paper Money Collectors, the Battle Creek Coin Club, and the Michigan Token and Medal Society. 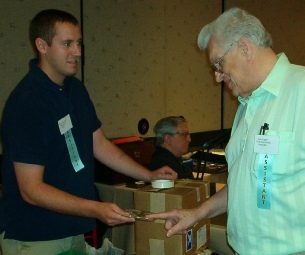 Enthusiasts anticipated the arrival of the Michigan State Numismatic Society Spring Convention & Coin Show (aka MSNS Show or Michigan State Coin). This event was hosted by the Battle Creek Coin Club, Mich-Tams and Paper Money of Michigan and co-hosted by Paper Money Collectors of Michigan, Michigan Token and Medal Society, and Battle Creek Coin Club. The MSNS Show was held at the Dearborn Hyatt. That was where one came to relish the large bourse from April 23 -25 (Thurs-Sat). Cost for a dealer table was $300. There were even educational forums for all ages to learn about numismatics and receive cool gifts, not to mention free pizza and punch. 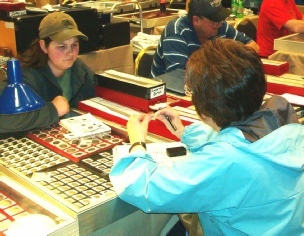 This was also an opportunity to buy, sell, and trade coins and paper money at the largest type event in Michigan held semi-annually, both spring and fall. From elongated commemorative Lincoln Cent coins to Wooden Nickels there are always fascinating things to see. If you prefer ancient coins or world money, that was there in plenty too. 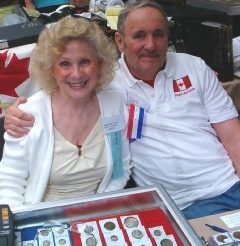 If one wished to show off their coin collection, there was an exhibit case display room and many competitors for the awards from acknowledged entries to Best of Show awards for Adults and Juniors. In need of a change from work or school or other hobbies, the MSNS Spring Show was the place to be. It was an event that allowed anyone to just look around and observe the many coins for sale, sell scrap gold, exchange cool coins all under the roof of the beautifully designed Dearborn Hyatt. The MSNS show was founded in 1956. It always provides a service forum to studying money and its different uses. The members are a collective of youths, students, hobbyists and collectors of coins, tokens, medals, currency, and fiduciary materials. MSNS is a 501(c)3 educational non-profit organization. Members actively bring objects that meet a Dealer's Code of Ethics. Each semi-annual convention includes an Educational Forum, Educational Exhibits, associated member club meetings, and an active bourse floor supplemented by an auction. 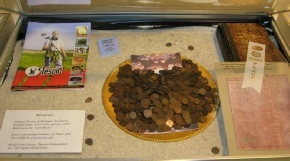 While the purpose of the Society is to encourage and promote the science of numismatics, it also is to aid its members in the acquisition, study and exhibition of numismatic material. 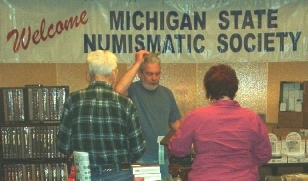 The MSNS Show has a genuine interest in keeping alive the interest and knowledge of numismatics. Being a part of this environment helps promote continuous amicable associations with others interested in numismatics. It is important to participate in these events such as the MSNS Shows because it also helps keep this tradition viable and running. The MSNS Show enables new collectors and students to get involved in the learning process. It can also be seen as something that can be handed down to other generations. To see hundreds of venders all shuffling money around was entertaining to see. So come on over and smell the coins at the MSNS Show. 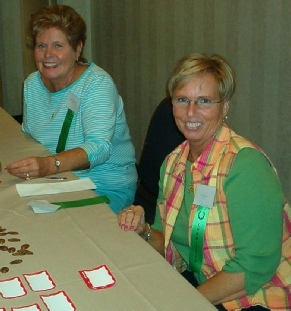 Late in the afternoon of the second day, Sheila Walker and Becky Moore of the Battle Creek Coin Club were busy at the registration table. reference books and other supplies. SilverTowne's Tyler "Buck" Abel (left) helps Coin Castle's Arnie Kozikowski with pricing and availability. 50th wedding anniversary a few years back. 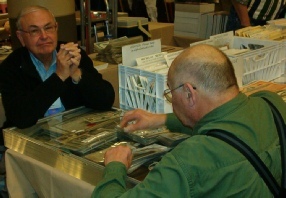 Dealer Larry Falater works with history professor Karl Mark Pall. 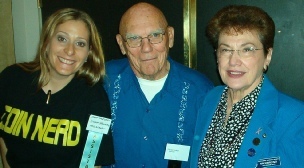 Dealer Assistant Diane Jellinek sports the trendy "Coin Nerd" tee with Past President Charles Fenwick and Past President Ann Bobrofsky. at many conventions for her snack packs of mixed nuts. Jeff Peters of Jade Rare Coins was a happy customer (and it was his birthday). Eldert Bontikoe of Pegasi in Ann Arbor examines a Roman coin. Dealer's Assistant Amanda Ehlers (left) helps a client with a checklist. 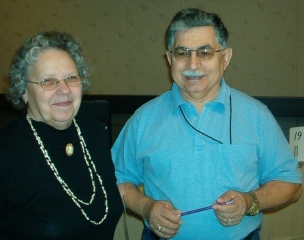 Dealer Shirley Serentis of Acropolis Coins in Morgantown, West Virginia, always brings her assistant Gus to every show. 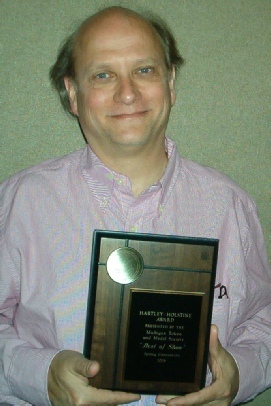 Tom Dombrowski won the Hartley-Holstine Award from the Michigan Token and Medal Society for his exhibit on the Presidential Medal of George Bush. 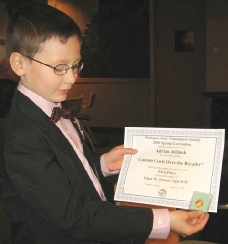 Adrian Jellinek with his first place award for "Selected Lincoln Cents of Each Beginning Decade Year." Above and Below: Metal Detecting took a Miscellaneous win. Metal Detecting will be a new Category for the Fall 2009 Convention. 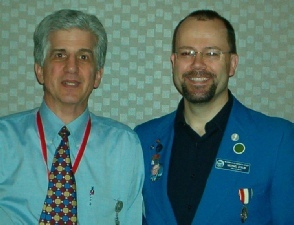 Webmaster Mike Marotta and MichMatist Editor Mike Strub.